Moving Crops and the Scales of History is a scholarly collective working at the intersection of global history, agricultural history, and the histories of science and technology, to play with scales of historical writing and historical space, time and agency. We selected crops as our device to rethink narratives of global circulations because they are a very special type of human artefact, living organisms literally rooted in their environment. 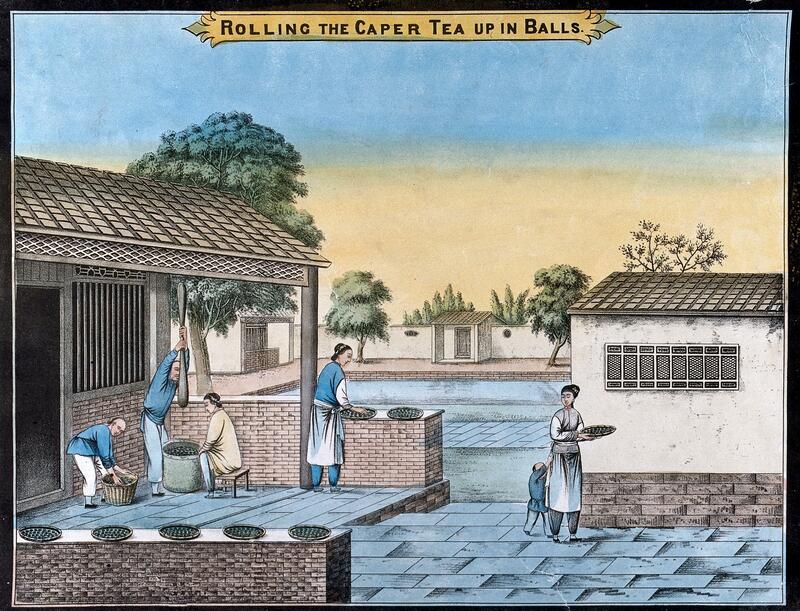 A tea plantation in China: Workers roll the caper tea into balls. Coloured lithograph. After the US Civil War, tobacco farms along the border of Virginia and North Carolina shrunk back to the small size that had disappeared with the rise of antebellum plantations. The small farms used larger labor forces to remain viable, and extended families rotated their labor across the farms of all family members for harvest and curing. Image courtesy of the North Carolina Collection, University of North Carolina at Chapel Hill. Though most of us equate beer with its European variant, barley-beer, almost every human society produces some beer-like drink, a mildly alcoholic liquid brewed from locally available starches, one essential product of the local cropscape. When the British began to grow tea in colonial India, the cropscape that developed was radically different from the Chinese scenario. The cultivation of tea as a commercial crop entailed the creation of new places, as the plantations radically altered the virgin forests they replaced. Cropscapes offer new perspectives on the size of tobacco cultivation units over the centuries. In other chapters we have analyzed the life-cycle flexibility of the tobacco plant—that is is a perennial grown commercially as an annual. Water is an essential component of all cropscapes. Crops need water and so too do humans and animals; water slakes the thirst of living creatures, and human populations also use water to keep clean, and for almost every kind of processing and manufacture, from cooking and pot-making to nuclear cooling towers. I am an an Associate Professor of History at Texas Tech University and the Associate Editor of Technology and Culture. My dissertation studied the interactions between the US tobacco industry and its interaction with tobacco agriculture over three centuries; it appeared as the book Making Tobacco Bright: Creating an American Commodity, 1617–1937 (Johns Hopkins University Press, 2011) (View) and as a part of Plantation Kingdom: The American South and Its Global Commodities (Johns Hopkins University Press, 2016) (View), and, with Bruce E. Baker, The Cotton Kings: Capitalism and Corruption in Turn-of-the-Century New York and New Orleans (Oxford University Press, 2015) (View), as well as several articles and book chapters. I am currently completing the monograph Technology and the Industrial Revolution for Cambridge University Press—research supported by a Marie Curie International Incoming Fellowship (#628722) at the University of Leeds 2014–16. My latest academic interests center around the history of tea plantation is India with specific focus on the evolution and transfers of technology in the tea industry. This interest, of late, also has drawn me into the history of global circuation of (other) crops and commodities. More broadly I am a historian of science, technology, and medicine in colonial India. Relevant works include "Betwixt Science and Religion; East and West: Jesuits in 17th and 18th Century Southern India’," in Yiftach JH Fehige (ed. ), Science and Religion: East and West, Routledge, Oxford and New York, 2016; "College of Engineering, Guindy," in DP Chattopadhyay and Uma Dasputa (eds), Science and Modern India: An Institutional History," Pearson Education, New Delhi, 2010; with Srinivasa Rao, "Colonialism and the Development of Electricity: The Case of Madras Presidency, 1900–1947," Science, Technology & Society, Vol. 15, No.1, 2010. Moving Crops and the Scales of History (currently nearing completion). We borrow our model from jazz and its non-linear explorations of themes. We offer six sets or chapters: Times, Places, Sizes, Actants, Compositions and Reproductions. Each set consists of several riffs or cases, deliberately contrasting cropscapes from different periods and of different scales. Rather than aiming at exhaustive coverage, we choose cropscapes that illustrate unexplored historical scales or connections, unexpected dynamics or constellations. Crops and History: Keynote lecture by Francesca Bray, 6th Forum for the History of Technology in China, June 4–5, 2018, Hangzhou. Reassembling Crops for Changing Climates (panel organizers Maria del Mar Gago and Harro Maat), ICOHTEC, July 18–21, 2018, Saint-Etienne, France. Crops, Food and Environmental Transformations Across Time and Space (panel organiser Anne Gerritsen): WEHC, July 29–August 3, 2018, Boston. Presentation by Tiago Saraiva on Moving Crops, Brazilian Society for the History Science, Paraiba, October 2018. Moving Crops and the Scales of History: Roundtable (panel organizer Francesca Bray), SHOT, October 11–14, 2018, Saint Louis. Moving Crops and the Scales of History: Seminar by Francesca Bray, Centre for the History of Science, Technology and Medicine, King’s College London, November 21, 2018. In preparation: Bray, Hahn, Lourdusamy, and Saraiva: “Moving Crops: Reflections on Rootedness and Mobility”: Article for special issue of Transfers, 2019. In press: Francesca Bray, "Tracking the Translation of the Savoir-faire of Tea from China to British India," in Pamela H. Smith (ed. ), Entangled Itineraries of Materials, Practices, and Knowing Across Eurasia (University of Pittsburgh Press, expected 2019).